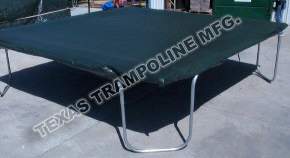 Protect your investment with a trampoline cover from Texas Trampoline. A trampoline cover will protect the life of your trampoline by keeping sun, tree sap and things birds do off your trampoline. A trampoline cover is also a great way to deter unauthorized use when you are not home. Custom covers also available, call (800) 700-5887 to place your order. Fits Texas Trampoline size 17x10.